22.11.2010 - The final will be played in Aalborg at the occasion of the EHF EURO 2010. 01.04.2010 - Faroe Islands, Finland and Moldova will visit Estonia on 2-4 April. The winner of the tournament will meet Israel in December during the Women's EHF EURO 2010. 22.03.2010 - The home team win the regional group of the 2010 IHF/EHF Women’s Challenge Trophy in Tel Aviv. 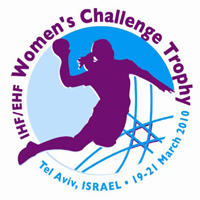 19.03.2010 - Armenia, Cyprus and Malta will visit Israel for the 2010 IHF/EHF Women’s Challenge Trophy group matches.